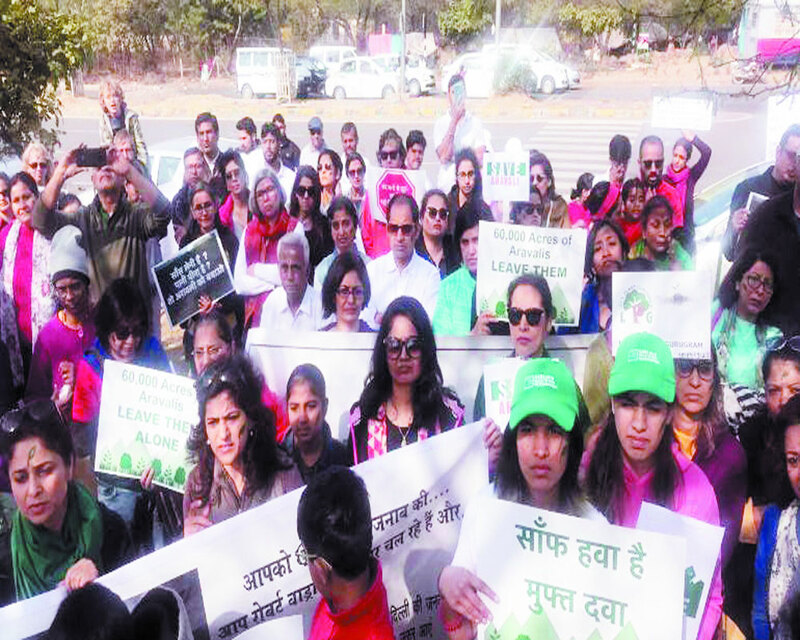 The Punjab Land Preservation (Haryana Amendment) Act (PLPA), passed recently by the Haryana Legislative Assembly, has understandably alarmed those who care for the ecology of the very large part of the Aravalli hills that fall in Haryana. The PLPA was enacted in 1900 to “preserve” land in undivided Punjab by curbing activities like the felling of trees for timber, quarrying for rocks, agriculture, herding and other pastoral preoccupations on land notified under it. The Act disallowed all human activity that could affect the availability of sub-surface water, alter the landscape, lead to biodiversity loss and other unpredictable consequences. There arises here the question of the Kant Enclave, a residential colony in Faridabad. The Supreme Court had, in the matter of MC Mehta Vs Union of India & Others, ordered its demolition on September 11, 2018, on the ground that it was built on forest land. The case raised a critical issue — whether in the State of Haryana, land notified under the provisions of the Punjab Land Preservation Act, 1900, was forest land or was it required to be treated as forest land? The Supreme Court had answered in the affirmative. Also, by an order on December 12, 1996, the Supreme Court had directed that the Centre’s prior approval was necessary for any non-forest activity within a “forest” and that any ongoing activity without that must cease forthwith. One will have to watch how the implementation of the amended Act proceeds in the context of the various orders passed by the country’s apex court and how it impacts the suits being heard under the provisions of the PLPA. Meanwhile, one needs to point out that its impact on the environment in the areas around the Aravalli and Shivalik ranges, that fall within Haryana, will be devastating. These constitute a critical ecological and biodiversity zone that has nearly 400 species of plants and is home to 200 species of native and migratory birds. A huge part of the wildlife habitat between Asola and Damdama could be destroyed, leading to the extinction of local wildlife of which there is a variety — leopards, wolves, hyenas, jackals, porcupines, mongoose, civets, jungle cats, rhesus macaque and so on. There has been an increase in the presence of all these species, particularly after the closure of mines. They will now be forced out again. There will be other consequences. Construction and mining activity in the Aravalli area and the dust generated by it is bound to increase air pollution not only in the adjacent areas but even in Delhi, the national capital, where things are very grim already and where the situation gets particularly bad in the period between October and January every year. According to a research paper published by the Ministry of Earth Sciences in October, 2018, 21 per cent of Delhi’s PM2.5 (particulate matter smaller than 2.5 micron) air pollution is caused by the presence of dust. The result? The least serious afflictions include breathlessness, coughing, sneezing, constriction inside the chest, allergy and aggravation of asthma. The serious illnesses include ischaemic heart disease (ischaemic stroke) and cerebrovascular disease (haemorrhagic stroke), chronic obstructive pulmonary disease and respiratory infections. Besides, a study by researchers at Columbia University’s Mailman School of Public Health shows that people living in areas with high pollution levels are more likely to have bone fractures as a result of osteoporosis. Air pollution has been identified as the fifth biggest cause of mortality in India. Further, according to studies, as many as an estimated 10,000 people die prematurely in Delhi every year as a result of air pollution, and residents could live for an additional nine years if Delhi met World Health Organisation’s air quality standards. Concern over the alarming levels of air pollution in Delhi was voiced by the Supreme Court, which on October 24, 2018, expressed shock over the disappearance of 31 hills in the Aravalli range in Rajasthan and asked the State Government to stop all illegal mining in an area, measuring 115.34 hectares, within 48 hours. The Bench of Justices Madan B Lokur and Deepak Gupta referred to the huge amount the Rajasthan Government was earning from mining activities in the Aravalli, but said that notwithstanding this, it could not endanger the lives of lakhs of people as the disappearance of the hills could be one of the reasons for the rise in the pollution level in Delhi-National Capital Region. It directed Rajasthan’s chief secretary to file an affidavit regarding compliance of its order within a week. The assault on the Aravalli in Haryana and Rajasthan underlines the growing tendency to prioritise development in terms of industry and infrastructure over the environment and animal habitats. The Uttarakhand Government’s decision to build a highway through the Corbett National Park is an example. Its construction and the plying of vehicular traffic through it will have disastrous consequences for wildlife, particularly tigers. Another is the Maharashtra Government’s diversion last year of 467.5 forest land in Yavatmal district for a cement plant. Further, its recommendation has led to the clearance, in principle, of the grant of 87.98 hectares of land in Kondhali and Kalmeshwar ranges to an explosives company in Chakdoh for manufacturing defence products. Worse, the land earmarked being reportedly in the tiger corridor between Bor and Melghat tiger reserves, the factory would prevent the movement of tigers between the two. This alarming tendency mentioned will cause irreparable damage to the country’s environment unless reversed. That can happen only if a strong resistance is mounted. The sterling role played by the judiciary, the protests against constructing the road through Corbett, and Haryana’s PLPA amendment Act, are heartening but the protests need to become much larger for politicians to listen.